The 4th Pacific Rim Policy Exchange (PCPX (hey, it’s only me who coined the acronym PCPX, the organizers didn’t) officially started last night. The welcome reception was hosted by the Institute for Public Affairs (IPA-Melbourne, Australia). • Khalil Ahmad, from Alternate Solutions Insitutite, Lahore, Pakistan. It is Pakistan’s first and only free market think tank. • Chung-ho Kim, Center for Free Enterprise, Seoul, S. Korea. Should also be Korea’s first and only free market think tank. • Mr. You, Masaru Uchiyama, Japanese for Tax Reforms, Tokyo. Japan’s first and only low-taxes and free market advobacy group. • Peter Wong, Lion Rock Institute, Hong Kong’s only free market institute to help remind the HK government to retain the free market philosophy and policies. • Raymond Ho, Momentum 107, HK’s pressure group to remind the HK government to stick to balance budget policy and not fall to the temptation of endless borrowings. • Xingyuan Feng, Cathay Institute for Public Analysis, Beijing. One of China’s two free market think tanks. • Parth Shah, Center for Civil Society, Delhi. One of India’s free market think tanks, focusing on school choice campaigns. • Jargal Dambadarjaa, Mongolians for Fair Taxes and Wise Spending. Self-explanatory advocacy group based in Ulaan Baatar. • Wan Saiful Wan Jan, Institute for Democracy and Economic Analysis, Kuala Lumpur. Malaysia’s only free market think tank. • Fengiang Liu, Beijing Taxpayers Alliance, the leading advocacy group for low taxes in China. 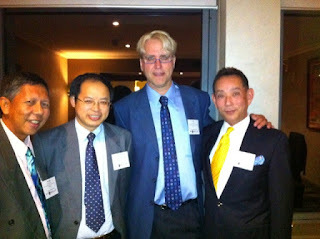 From left: Xingyuan, Peter Holle of FCCP-Canada, and Mr. You. There should be more who will show up later today. Among old friends outside Asia who showed up last night were of course, the guys from the main sponsor, the Americans for Tax Reforms (ATR) led by its President, Grover Norquist, Jane Frazer, John Kartch, and Kelsey Zahourek of the Property Rights Alliance. There were a number of participants from other countries – Canada, Argentina, New Zealand, Australia. The ATR is a persistent big sponsor of this annual event whose main objective is to gather the major free market thinkers and leaders from the Pacific region and neighboring countries, for an exchange of ideas, experiences and activities on how to advance individual liberty and voluntary exchange in a free enterprise system. How to minimize heavy state coercion and over-regulation of our lives and our pockets. The state is a penniless but monster institution who got super-super rich via endless confiscation of a growing portion of our income, savings and investment. Many states and governments, local and national, have become very powerful and intrusive that they can dictate how expensive the goods and services that we buy and sell can be, via various taxes and fees, and the cost of compliance with their various regulations, restrictions, certifications and authorizations. No wonder so many people want to become politicians and bureaucrats because of the tremendous power they can wield over our lives, with the bleeding heart goal of protecting the poor without admitting that their endless intervention and taxation creates poverty and personal irresponsibility. And speaking of governments, we should not forget the supra-national institutions and international bureaucracies. Like the UN, the WB, IMF, ADB, WTO, OECD, USAID, and many other foreign aid bodies. They are the great allies of many national governments in instituting various forms of sectoral central planning. Ok, time to prepare my presentation for today’s conference.